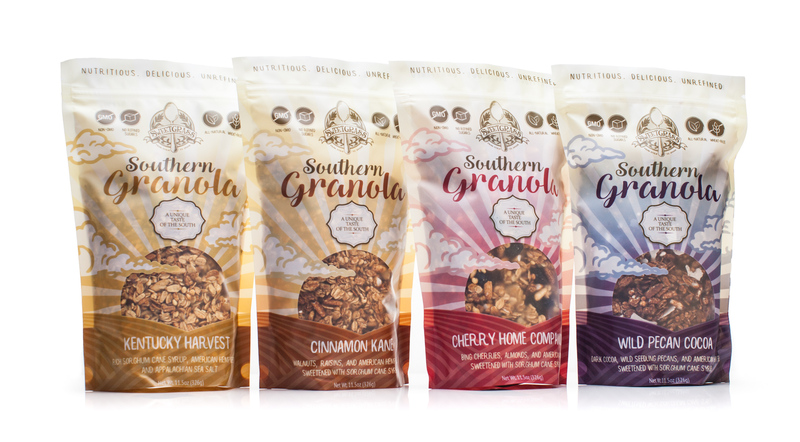 We’re so excited to finally show off our new Sweetgrass Granola packaging and branding refresh! When we made our first market batch of “Sorghum Granola” 6 years ago we packaged it in sandwich bags for the Lincoln County farmer’s market for a little extra income next to our organic vegetables. When we created “Sweetgrass Granola”, we hand stamped our logo onto kraft paper bags for our first retail shelf in Lexington, Kentucky. Then we upgraded to printed film pouches that showed off our signature ingredient, sorghum cane syrup, and reached stores all over the state. Throughout it all our mission has been simple: To showcase the unique flavors of our beautiful Kentucky landscape. Now, almost 3 years into taking our little food business seriously, we find ourselves once again improving our packaging and deepening in our mission. Sweetgrass Granola will become Sweetgrass Southern Granola and will celebrate the producers and products of the American South and Appalachian regions. Expect to learn more about what makes our granola so “Southern” and why that’s a good thing in upcoming blog posts! Thanks for all of your support throughout the years and on our new adventures! ← Sweetgrass Fam and New Product featured at The Lane Report. Beautiful redesign you guys! Great product and wonderful family! I am Jeannette Rowlett, Executive director , of the KY Guild Gallery. How can we get your product to sell in our gallery, with our other KY Proud items? We have KY proud “Creative Coffee,” jams and jellies and artisan cheeses.